I didn't even say anything. Why is she laughing? Breathless – In the 50 years since its release, what more can be said about this beautiful film? Hundreds of critics have critiqued. Hundreds of reviewers have reviewed. If I threw in my two I would quickly realize what these people have already discovered: there have been millions of words used to describe Breathless and none of them can quiet adequately achieve what the film itself so eloquently states on its own behalf. Rarely does a film start a movement. This movie not only started a movement, it defined it so well that even today we are still feeling its impact. Its jarring jump cuts confused me in an intriguing way. The editing in the car scene startled me with discontinuity that, if used incorrectly, could have cause a train wreck, but instead brought me further into the world of Michel (Jean-Paul Belmondo). The handheld, live action feel made the film more real. Studio’s try to recreate this environment, Godard went out into the environment and just started rolling. 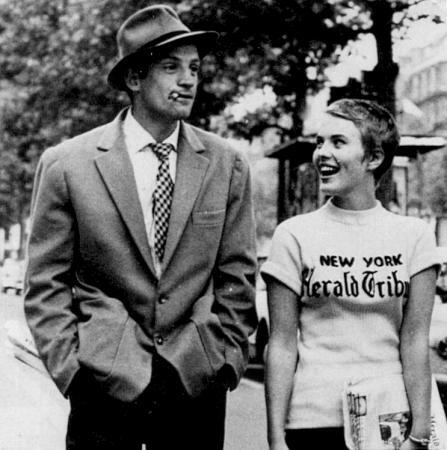 Breathless is a guide on how to be cool. This movie teaches us to act as if someone is always watching, but at the same time be aloof. It tells us what kind of music to listen to, how to walk, how to talk, what kind of glasses to wear, how to smoke a cigarette, how to flirt with woman, what drink to order and how to wait for it. In a sense it shows us how to be in. We love Michel so much for his debonair and easy style that we forgive him his serious flaws and indiscretions. We are quick to ignore a murder he commits in order to get closer to him and feed off his cool persona. We, like Patricia (Jean Seberg), want to be his friend. And while she may eventually turn on him, we have resolved ourselves to never do so. He mean too much to us and we feel we have so much to learn from him. And then there is Jean Seberg. How can we not fall in love with her and her cute French with the American accent? She walks around selling the New York Herald Tribune in a tee-shirt stating that fact, with a naive, wide-eyed free spirit that is just soaking in the world around her. And what a carefree and fun world it is for her. A world of fast cars, exciting people, and laissez-fare attitudes. We all want what she has. The images on the screen are iconic. The feeling we get from viewing this film is lasting. The Herald Tribune Patricia is peddling would fall short even if the efforts of those thousands of printed words were all directed at describing this film. So I will stop trying to do what better writer than I could not. I will just let Breathless do what it does best for itself. Art & Copy – In a time when it is en vogue to bash advertisements and advertisers for being an ugly distracting force in our lives created by low rung sell outs, Art & Copy presents to us an opposing view: advertisers are artists. The film investigates what it is that makes an advertisement good. It is too easy to look at advertising and call it a lowest common denominator. This is a mistake that a lot of films and books make. They make a sweeping generalization about the pervasiveness of advertising, and then point out its near ubiquity in our daily lives and then erroneously concluded that this makes the industry a devils playground. Art & Copy shows you the artistry of an ad (although there are several points in the film where the ad men and women highlight that there are trashy ads out there, but it is also stated that, “you can do so much more” and extrapolating out, I would contend these elite creatives feel advertisements should do so much more); the creative genius of the rare few that understand what a good ad does and how to create it. We are introduced to several people that embody what a good ad person does: they tap into a feeling that resonates with an audience. We meet several artists that took their creative talents and found an outlet for them. Lee Clow implores halfway through the film: creative people rise up! And they did. A good ad is more than just a mechanism to sell a product. A good ad can inspire. It can make a person strive to achieve something they otherwise would not have thought possible. A good ad is, at its core, art. Art is a tool through which a message is delivered. Advertising art just does it a little more directly. In the words of Oscar Wilde: It is through art, and through art only, that we can realize our perfection. A good ad uses art to inspire us to achieve better. And if you want to drink a Coke while you are out there achieving, why not? ... and this is how I look when I'm about to eat a hamburger. Delicatessen – With this being Jean-Pierre Jeunet’s debut film it is easy to see why he has since been regarded as one of the finest and most innovative directors working today. His style is distinctive. His stories are unique. The execution is flawless. 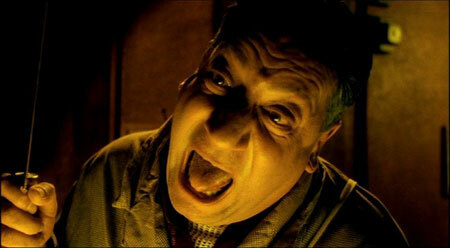 Delicatessen is a mad house of creative genius and dark beauty. A nightmare we enjoy being in and are sad when we must finally wake up. We are released into a tenement where people are brought in by the landlord, a butcher, to be butchered and eaten. An obvious plot for a comedy, right? 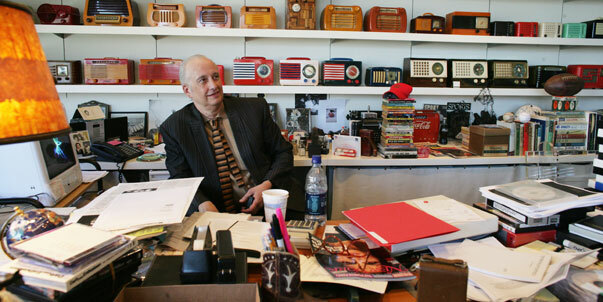 Louison is played by Dominique Pinon who appears as though he was plucked right out of a vaudeville act and dropped on Jeunet’s set. He creates a character that is good hearted, oblivious at times, and never dull. There are scenes in the film that could have been silent, and the impact would not have been lost. A tea time scene with his love interest Julie (Marie-Laure Dougnac) unfolds with a beautifully choreographed awkward interaction. In this scene Julie removes her glasses and cannot see Louison. Louison is confused and just trying to catch on to what Julie is doing and why she is acting the way she is. He is always one step behind. The whole movie is in that scene. Louison is as blind to his surrounds as Julie is without her glasses. Beautiful, simple and brilliant. Delicatessen invites us to laugh and feel a delightful guilt at the topics we are being allowed to smile at. Cannibalism rarely ever gets to be this funny. Let’s enjoy the opportunity we have to laugh at it. Clash of the Titans (1981) – It was nice reminder of a time when Harry Hamlin got movie roles and why we stopped giving them to him. It is difficult to pick exactly why the movie didn’t work, but I am sure it has to do with Bubo the mechanical owl. A Scanner Darkly – The lives of paranoid drug addicts should have been more interesting. Drugs ruined the lives of the characters. The irony being you would have had to have been high as a kite in order to find this movie entertaining.